Diesel fuel /ˈdiːzəl/ in general is any liquid fuel used in diesel engines, whose fuel ignition takes place, without any spark, as a result of compression of the inlet air mixture and then injection of fuel. ( Glow plugs, grid heaters and block heaters help achieve high temperatures for combustion during engine startup in cold weather.) Diesel engines have found broad use as a result of higher thermodynamic efficiency and thus fuel efficiency. This is particularly noted where diesel engines are run at part-load; as their air supply is not throttled as in a petrol engine, their efficiency still remains very high. The most common type of diesel fuel is a specific fractional distillate of petroleum fuel oil, but alternatives that are not derived from petroleum, such as biodiesel, biomass to liquid (BTL) or gas to liquid (GTL) diesel, are increasingly being developed and adopted. To distinguish these types, petroleum-derived diesel is increasingly called petrodiesel. Ultra-low-sulfur diesel (ULSD) is a standard for defining diesel fuel with substantially lowered sulfur contents. As of 2016, almost all of the petroleum-based diesel fuel available in the UK, mainland Europe, and North America is of a ULSD type. 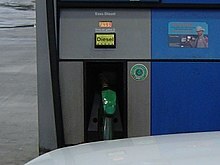 In the UK, diesel fuel for on-road use is commonly abbreviated DERV, standing for diesel-engined road vehicle, which carries a tax premium over equivalent fuel for non-road use. In Australia, diesel fuel is also known as distillate,  and in Indonesia, it is known as Solar, a trademarked name by the local oil company Pertamina. The principal measure of diesel fuel quality is its cetane number. A cetane number is a measure of the delay of ignition of a diesel fuel. A higher cetane number indicates that the fuel ignites more readily when sprayed into hot compressed air. 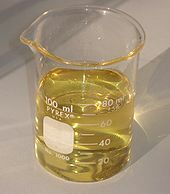 European (EN 590 standard) road diesel has a minimum cetane number of 51. Fuels with higher cetane numbers, normally "premium" diesel fuels with additional cleaning agents and some synthetic content, are available in some markets. As of 2010, the density of petroleum diesel is about 0.832 kg/L (6.943 lb/US gal), about 11.6% more than ethanol-free petrol (gasoline), which has a density of about 0.745 kg/L (6.217 lb/US gal). About 86.1% of the fuel mass is carbon, and when burned, it offers a net heating value of 43.1 MJ/kg as opposed to 43.2 MJ/kg for gasoline. However, due to the higher density, diesel offers a higher volumetric energy density at 35.86 MJ/L (128,700 BTU/US gal) vs. 32.18 MJ/L (115,500 BTU/US gal) for gasoline, some 11% higher, which should be considered when comparing the fuel efficiency by volume. The CO2 emissions from diesel are 73.25 g/MJ, just slightly lower than for gasoline at 73.38 g/MJ. Diesel is generally simpler to refine from petroleum than gasoline, and contains hydrocarbons having a boiling point in the range of 180–360 °C (360–680 °F). The price of diesel traditionally rises during colder months as demand for heating oil rises, which is refined in much the same way. Because of recent changes in fuel quality regulations, additional refining is required to remove sulfur, which contributes to a sometimes higher cost. In many parts of the United States and throughout the United Kingdom and Australia,  diesel may be priced higher than petrol. [ clarification needed] Reasons for higher-priced diesel include the shutdown of some refineries in the Gulf of Mexico, diversion of mass refining capacity to gasoline production, and a recent transfer to ultra-low-sulfur diesel (ULSD), which causes infrastructural complications. In Sweden, a diesel fuel designated as MK-1 (class 1 environmental diesel) is also being sold; this is a ULSD that also has a lower aromatics content, with a limit of 5%. This fuel is slightly more expensive to produce than regular ULSD. This untaxed diesel is dyed red for identification,  and using this untaxed diesel fuel for a typically taxed purpose (such as driving use), the user can be fined (e.g. US$10,000 in the US). 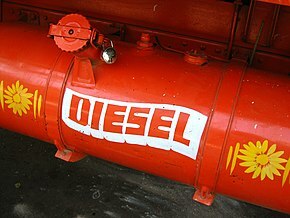 In the United Kingdom, Belgium and the Netherlands, it is known as red diesel (or gas oil), and is also used in agricultural vehicles, home heating tanks, refrigeration units on vans/trucks which contain perishable items such as food and medicine and for marine craft. 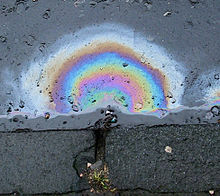 Diesel fuel, or marked gas oil is dyed green in the Republic of Ireland and Norway. The term "diesel-engined road vehicle" (DERV) is used in the UK as a synonym for unmarked road diesel fuel. In India, taxes on diesel fuel are lower than on petrol, as the majority of the transportation for grain and other essential commodities across the country runs on diesel. Diesel engines for airships were developed in both Germany and the United Kingdom by Daimler-Benz and Beardmore produced the Daimler-Benz DB 602 and Beardmore Typhoon respectively. The LZ 129 Hindenburg rigid airship was powered by four Daimler-Benz DB 602 16-cylinder diesel engines, each with 1,200 hp (890 kW) available in bursts and 850 horsepower (630 kW) available for cruising. The Beardmore Typhoon powered the ill-fated R101 airship, built for the Empire airship programme in 1931. 2, collectively known as NOx. NOx due the high temperature and pressure. In spite of it is naturally present in the atmosphere it's excess can contribute to smog, acid rain and influence human health after reacting with ammonia, moisture, and other compounds. Modern diesel engines ( Euro 6 & US EPA standards) use exhaust gas recirculation into intake to reduce oxygen excess present in combustion and urea injection to turn NOx into N2 and water. The urea reacts with nitrogen oxides to form water and nitrogen. Water in fuel can damage a fuel injection pump; some diesel fuel filters also trap water. Water contamination in diesel fuel can lead to freezing while in the fuel tank. The freezing water that saturates the fuel will sometimes clog the fuel injector pump. Once the water inside the fuel tank has started to freeze, gelling is more likely to occur. When the fuel is gelled it is not effective until the temperature is raised and the fuel returns to a liquid state. Diesel is less flammable than gasoline / petrol. However, because it evaporates slowly, any spills on a roadway can pose a slip hazard to vehicles. After the light fractions have evaporated, a greasy slick is left on the road which reduces tire grip and traction, and can cause vehicles to skid. The loss of traction is similar to that encountered on black ice, resulting in especially dangerous situations for two-wheeled vehicles, such as motorcycles and bicycles, in roundabouts. ^ Knothe, Gerhard; Sharp, Christopher A.; Ryan, Thomas W. (2006). "Exhaust Emissions of Biodiesel, Petrodiesel, Neat Methyl Esters, and Alkanes in a New Technology Engine†". Energy & Fuels. 20: 403–408. doi: 10.1021/ef0502711. ^ ‹See Tfd› DE 67207 Rudolf Diesel: "Arbeitsverfahren und Ausführungsart für Verbrennungskraftmaschinen" pg 4.